Imphal, October 6, 2017 (DIPR): Education Minister Thokchom Radheshyam Singh said that the expectations and concerns of the trainees should be prioritized and tried to be solved during the training. He said, imparting education or training to the youths should be done according to the demand and supply of the markets. The trainees, he pointed out, if trained according to the market’s demand, the qualified, skilled professions can avail job through placements or become an entrepreneur. He said proper counselling about the courses is a must to guide the students on the right path for better opportunity in their life. The Minister was speaking as Chief Guest at the inauguration of 2nd Batch Courses in Capacity Building for NE Region sponsored by Ministry of Skill Development and Entrepreneurship, Government of India, at National Institute of Electronics and Information Technology, (NIELIT) Imphal. He said that to utilise the best of the training received; the students must keep themselves up – to – date to remain relevant. The syllabus, need to be upgraded to become constructive for the future expectations. He said skilled professionals need to think beyond employment or job placement, but rather should dream to become an entrepreneur. Providing employment is one of the biggest tasks and entrepreneurship is the answer to the issue of unemployment. To become an entrepreneur, one has to be innovative by remaining efficient and getting prepare for future, he added. He also hinted that fund is available for the start – ups. The young professionals need to be trained to avail such financial assistance through proper supervision and counselling of the expert. Director, Science & Technology, E. Ibocha Singh said that the government cannot provide jobs for all the educated unemployed youths, but the technology holds the key to the problem of unemployment through self employment and providing an opportunity for others also. Executive Director NIELIT Th. Prameshwor Singh announced that the LED Assembly Unit will also be set up at Churchandpur and Senapati Centres of NIELIT on Public – Private Partnership (PPP) mode. 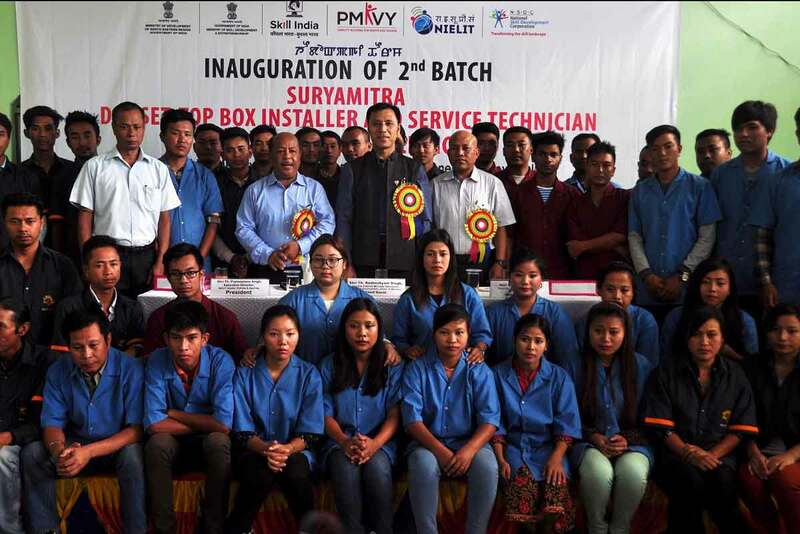 The inaugurated 2nd Batch courses include – Solar PV installer – Suryamitra, the Das Set–Top Box Installer and Services Technician and LED Light Repair Technician on two months duration with total intake capacity of 90 students. Teachers, instructor, staffs and students attended the inaugural function.